The Horizon Elite T5 is a brand new treadmill in the series, introduced in late 2017 with all new features and capabilities. It replaced the Adventure 5, and joins the popular Elite T7 and T9, both of which received their own upgrades for the new model year. Footprint : 73" x 35" x 61"
The new Horizon Elite T5 comes with a whopping 38 built in workout programs, more than most treadmills on the market, giving you a wide array of choices when it comes to your training. There are calorie programs, intervals, heart rate, distance, hills, time and more…plenty to keep you motivated and on track to meet your fitness goals. Ramp up the machine to 15% incline, an improvement on the 12% on the Adventure 5 model it replaces. This gives you a much more effective lower body as well a cardio workout. The Elite T5 challenges you even more, and allows you to easily change the incline with a touch of a button. You can start at the lower levels and work your way up. The Horizon Elite T5 includes a free wireless chest strap with purchase, which means you can keep tabs on your heart rate throughout your workout, staying in your ideal zone throughout. There are specific heart rate programs as well, with varying levels to challenge yourself. An exclusive feature only offered on Horizon treadmills, this unique three zone system gives you the perfect amount of support and give at various points in your stride. This not only significantly reduces impact on your joints, but puts you in the ideal walking/jogging/running position to maximize your results and keep you working out longer. For those of you who like to monitor your progress, the Horizon Elite T5 features ViaFit tracking, which automatically keeps tabs on all of your workouts and syncs seamlessly with your favorite fitness apps. This is a great free tool that allows you to see your progress over time, and set goals for yourself to achieve. You can also share your results with family and friends. 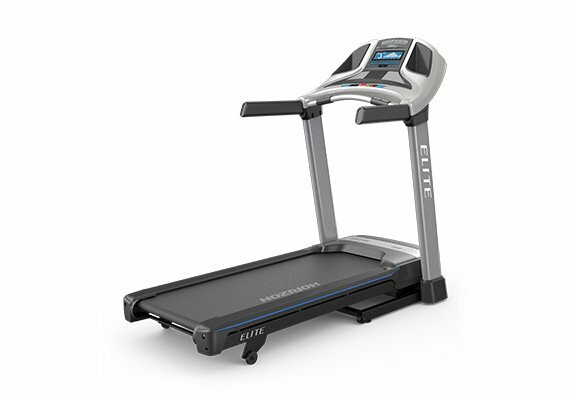 The new Elite T5 treadmill has plenty of other features to be excited about, including FeatherLight easy folding, built in speakers, the powerful Johnson Drive system, workout fan, energy saver mode, high max weight capacity and a very impressive warranty. Although the Elite T5 has everything you need for a great workout, the 20″ x 55″ deck might not be as comfortable for taller users, especially if you plan on doing a lot of running vs. walking. If that sounds like you, take a look at the new Elite T7 and Elite T9 models, both of which feature longer 60″ decks. Definitely not a deal breaker, but it’s worth a mention that the console features a basic LCD display. Some of the newer model treadmills come with touch screens, although they are usually a little more expensive than the T5, so it makes sense. The new Horizon Elite T5 is a great addition to the lineup, and gives you a more affordable option in the performance series. You get a large amount of built in workouts, enhanced incline capability, commercial-grade cushioning, heart rate monitoring, easy folding capability and workout tracking. That’s a lot of features and capabilities, especially given the price. Definitely consider this one if you are in the $1000 price range. If you are on the taller/larger size, or are more of a serious runner, take a look at the upgraded Elite T7 and T9 models.